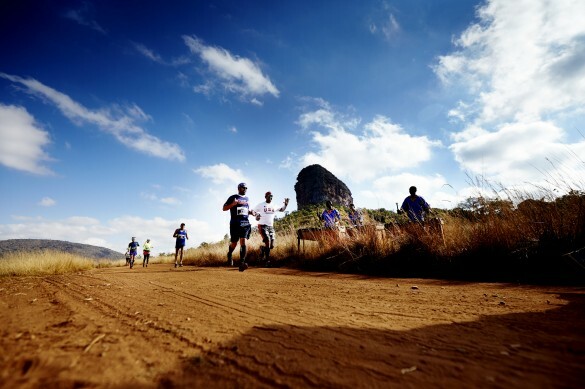 The Big Five Marathon is an exclusive event that combines a challenging marathon or half marathon experience with a classic African safari vacation. The race itself runs on a fantastic but tough trail route through the park with runners watched all the way by game wardens to ensure safety isn't compromised. We offer 5 and 7 nights packages for the event and there are add-on packages to Kruger National Park with a stay at Khoka Moya tented camp, Victoria Falls and the famous Rovas Rail and Cape Town Excursions. Ravineside Lodge is situated on the upper escarpment next to the Entabeni Rock. 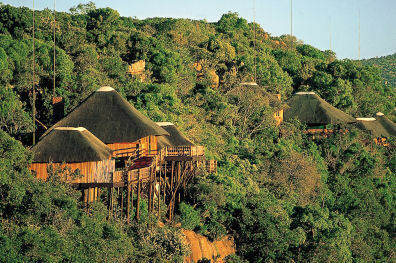 The lodge comprises tranquil thatched wooden lodges on stilts with bird's eye-views. Each lodge has 3 or 4 luxury en-suite bedrooms with an African ethnic theme. A private open plan lounge and bar area extends to the open sundecks. From here the guests can indulge in bird and game watching and experience the beauty of the revine with the rippling sound of water far down the valley. 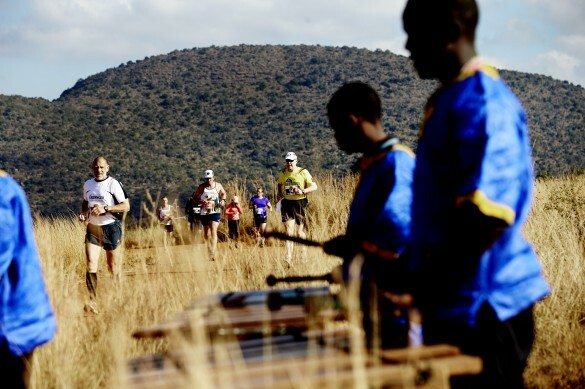 This award winning luxury resort hotel has an ideal location right at the entrance to the Lower Escarpment Gate and is the only resort where you are able to go for a training run while at the Big Five Marathon! The rooms are very luxurious, each with a small seating area and a bathroom en suite that features both a shower and seperate bath. There are a number of dining options at the resort and secluded patio areas for you to relax with a cooling drink after a day on safari. The journey to the race start takes about 75mins and all transfers are in open safari jeeps so that you get an additional safari ride on race day to add to those in the overall programme. Arrive at Johannesburg International Airport (also known as OR Tambo). 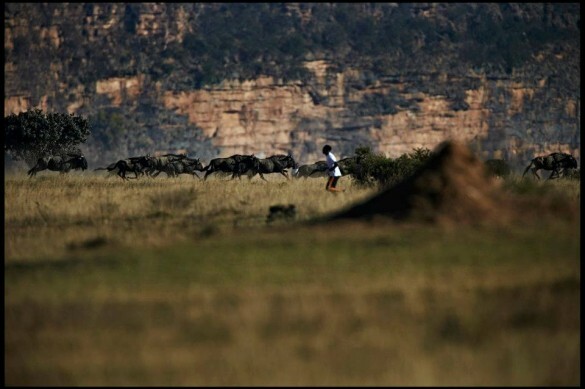 All participants are transferred on set transfer times from the airport to Entabeni Safari Conservancy. Transfer DEPARTURE times from the airport are: 08:30, 10:00, 12:00, 14:00 and 16:00. If any of the above transfers don't fit in with your travel plans it is possible to book an individual transfer at an extra surcharge (£235 each way). Upon arrival in Entabeni you will meet your tour leader and be checked in at your lodge. Participants arriving on one of the first three transfers (departure from Johannesburg International Airport at 08:30, 10:00 & 12:00) will have the possibility to go on the first of several exciting game drives. Day two and three of your stay in Entabeni are dedicated to exploring the game reserve through a daily game drive. During these days we will get accustomed to the park's geography, and climate, and we can slowly start preparing ourselves for Saturday's exciting event: The Big Five Marathon®. The daily game drive is included in the itinerary and will take place either in the early morning or in the late afternoon. A bush walk with an experienced armed ranger is also included on the third day, giving us a chance to get really close to the African nature and wildlife. Early morning game drives typically takes place between 06:00 and 09:30. During these early hours we will experience the cool African morning, spot spectacular wildlife, and most probably work up an appetite. Once back from the morning safari we will be richly satisfied by the overwhelming breakfast buffet that awaits us at our lodge/camp. The afternoon game drive begins around 16:00 arriving back at the lodge in time for dinner around 19:30. Similar to the morning game drive, the afternoon drive provides great wildlife experiences. Moreover the afternoon drive offers the opportunity to experience a genuine African sunset in ideal settings: enjoying a cold drink on the savannah, while admiring the changing colours of the darkening evening sky. The afternoon drive then turns into a night safari, where we will get the chance to spot the fascinating nocturnal wildlife with a spot light. After breakfast all the participants are transported from their respective lodges/camp to the starting point of the marathon. It is now time for the route inspection: all safari vehicles follow the route in a convoy, allowing the participants to examine the different running surfaces, note the locations of water posts, and assess the overall difficulty of the route. The big day has come. 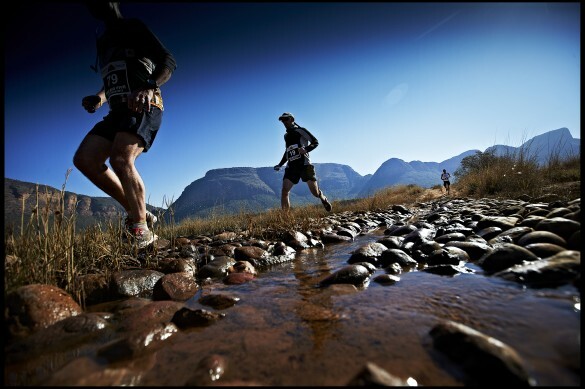 Today you will be met by a challenge that will be worth remembering: The Big Five Marathon®. In the morning all the participants will be transported from the various lodges and camps to the starting line in time for final preparations. The marathon is planned to start at 08:00, but delays must be expected, as the exact start time will be dependent on the location of the big five game - if too close to the route, the start will be postponed. Today we have time to relax after running on the African savannah. Additional game drives and excursions can be purchased and in the afternoon we will experience yet another fantastic game drive followed by our After Marathon Party. There will be great food, live entertainment, prize ceremonies, a big bonfire and partying under the African skies. On the final day at the Entabeni Private Game Reserve we have one last game drive either in the morning or in the afternoon. Those interested will also get the opportunity to stretch their legs on one final bush walk. In the evening farewell dinners will be held at the respective lodges/camp. Tansfer ARRIVAL times at the airport are 08:00, 12:00, 14:00, 16:00 and 18:00. As on arrival it is possible, for an extra surcharge, to book an individual transfer to Johannesburg if the group transfers don't fit your onward journey. Upon arrival in Entabeni you will meet your tour leader and be checked in at your lodge. Participants arriving on one of the first three transfers (departure from Johannesburg International Airport at 08:30, 10:00 & 12:00) will have the possibility to go on the first of a number of exciting game drives. The afternoon game drive begins around 16:00 arriving back at the lodge in time for dinner around 19:30. Similar to a morning game drive, the afternoon drive provides great wildlife experiences. Moreover the afternoon drive offers the opportunity to experience a genuine African sunset in ideal settings: enjoying a cold drink on the savannah, while admiring the changing colours of the darkening evening sky. The afternoon drive then turns into a night safari, where we will get the chance to spot the fascinating nocturnal wildlife with a spot light. During our stay we will have a number of park rangers allocated: one for approximately every ten participants. The rangers ensure our safety, drive the safari vehicles, provide competent guiding, coordinate the events with the race management, and are at our disposal around the clock. Furthermore a Tour Leader will be with the group from beginning to end assisting with every need of the participants. On the final day at the Entabeni Private Game Reserve we have one last game drive in the morning. A bush walk with an experienced armed ranger is also included today, giving us a chance to get really close to the African nature and wildlife. In the evening farewell dinners will be held at the respective lodges/camp. Our days at Entabeni Safari Conservancy has come to an end and it's time to head back to Johannesburg. As upon arrival all participants are transferred from Entabeni to Johannesburg International Airport. Transfer ARRIVAL times at the airport are 08:00, 12:00, 14:00, 16:00 and 18:00. Treat yourself to more game drives and bush walks staying at Khoka Moya tented camp situaqted near Kruger National Park. Spot the Big Five and other African wildlife at the beautifully situated camp in Manyeleti Game Reserve. Day 1: Leave Entabeni at the end of the marathon tour and drive to Manyeteti Game Reserve. The 7 hr journey will be broken up with an exhilirating zip wire experience gliding through a scenic river valley and a lunch stop. Dinner on arrival at the Montobeni camp. Day 2: After breakfast enjoy a game drive or a bushwalk. Afternoon into evening Game drives. Day 3: After breakfast drive from the camp to the province of Mpumalanga - which means 'place where the sun rises'. The Panorama Route is true to its name, with magnificent scenery including the legendary views from God's Window. The route also takes in Bourke's Luck Potholes, a rocky landscape where water has arroded deep cylindrical holes into the bare rock. Finally you stop at Blyde River Canyon, the world's thirs longest, for lunch in an old gold mining town, Pilgrims Rest (lunch not included) then back to camp in the late afternoon for dinner. Day 4: After breakfast enjoy another Game Drive or Bush Walk and a further Game Drive in the afternoon. Lunch and dinner at the resort today. Day 5: After breakfast enjoy another Game Drive or Bush Walk and a further Game Drive in the afternoon. Lunch and dinner at the resort today. Day 6: After breakfast you transfer back to Johannesburg. The journey time is approx 7 hrs and there will be a stop for lunch (not included) - arriving at around 3pm. Day 1: Leave Entabeni for Johannesberg and take the flight to Victoria Falls, Zimbabwe. 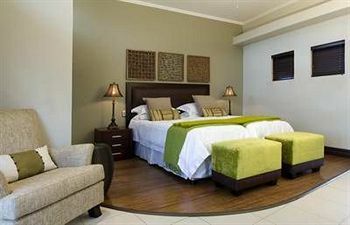 transfer to your hotel, the Victoria Falls Hotel, one of the most famous hotels in Africa, on bed and breakfast basis. Day 2: Walking tour around the Falls. Walking through the hotels gardens and continue down steps to the Falls. In the afternoon we take a sundowner cruise on the Zambezi River upstream from the Falls and enjoy a cold drink whileon the look out for crocodiles and hippo's. Day 3: Optional Activities. Today is set aside to try some of the optional activities on offer around the Falls; safari in Botswana's Chobe National Park, helicopter over the Falls, river rafting, or perhaps bunji jumping over the Falls. Day4: Time this morning for more optional activities before the transfer to Victoria Falls Airport and the flight back to Johannesburg to meet your connecting flight home. Rovos is known to be the World's most luxurious train. Starting in Pretoria it is a 5-star service from beginning to end, with full board and beverages on board included, plus a Pretoria city tour and 3 nights in Cape Town. Day 1: Relax over breakfast this morning before taking a pleasant 3hr drive to Zebra Lodge. Situated just 30km north of Pretoria the lodge has a breathtaking situation with giraffes, zebras and other planes game moving around freely. After lunch at the lodge spend the afternoon relaxing in the sun or enjoy exploring the 250 ha around the lodge on foot or mountain bike. Dinner and overnight at Zebra Lodge. Day 2: After a relaxing breakfast we head to Pretoria, also known as the Jacaranda City due to the 70,000 trees growing around its streets and gardens. As part of the city tour you will visit the impressive Vortrekker Monument, as well as the president's official home, the Union Building. Lunch will be taken close to the Capital Park Station, where you will join the Rovos Train. The train departs for the 1,600km journey to Cape Town in the afternoon. Day 3: Today we visit Kimberley, the Diamond City in the Northern Cape Province. Kimberley is the home of the famous Open Mine or Big Hole, the world's largest man-made excavation created during the 1870's diamon rush. Day 4: This morning we stop in the charming village of Matjiesfontein, known for its historical ambiance and unique Victorian look. After looking around this little hidden gem we continue on to Cape Town. We arrive in he evening and will be transferred to to our hotel, The Cullinin, a short distance from the station and the historic Waterfront. Day 5: Today is at your leisure in Cape Town - you can book from a wide selection of optional excursions locally from the Walk to Freedom Tour to Shark Cave Diving. Day 6: Today we depart for a tour of the famous Winelands of the Western Cape. Yu will visit several vineyards in thei glorious settings, lunch is included at one before returing to Cape Town where, this evening, we get together for a farewell dinner at the Gold Restaurant. Day 7: You will have time at leisure this morning - an airport transfer will be arranged according to the ime of your flight home. Pullamn Suites: The Pullman suites (7sq metres) are equipemed with a comfortable sofa-seat during the day with a conversion to a double or twin beds for the evening. They also have an en-suite bathroom with shower, a bar fridge with beverages of your choice and room service available 24hrs. Deluxe Suites: The Deluxe suites (10 sq metres) accommodate two passangers in either twin or double beds and have alounge area and en-suite bathroom with shower. They also have a bar fridge with beverages of your choice and 24hr room service. Dresscode: For the days on the train the dress is smart casual. Evening is more formal - for gentleman a jacket and tie is required while for ladies a cocktail/evening dress is suggested. Please note: Race entry is conditional to purchasing one of the land packages - there is strictly no entry only available. Final balance is due 10 weeks before departure.